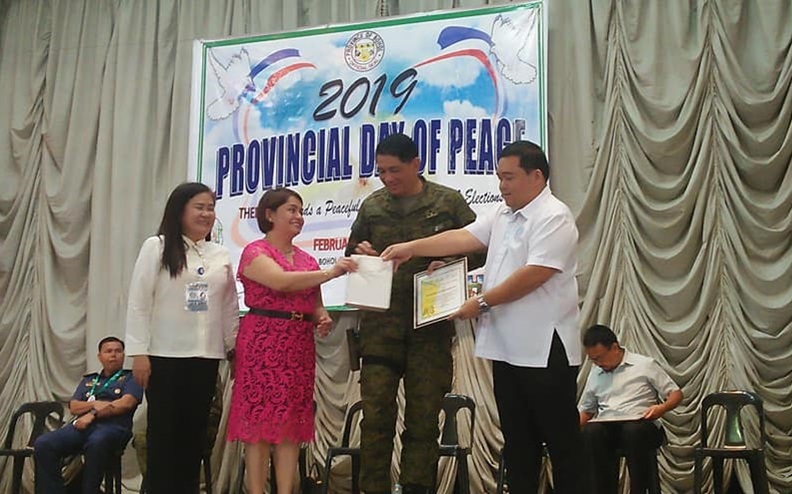 Brigadier Gen.Ignacio Madriaga (center, in fatigue uniform), commander of the 302nd Infantry Brigade, receives a recognition for being one of the speakers during the 2019 Provincial Day of Peace at the Bohol Cultural Center in Tagbilaran City on Monday. The Armed Forces of the Philippines (AFP) leadership in Bohol reminded candidates for the 2019 midterm elections to refrain from giving in to the demands of the New People’s Army (NPA) for the payment of the so-called “permit to campaign” (PTC) fee. Brigadier Gen. Ignacio Madriaga, commander of the Philippine Army’s 302nd Infantry Brigade, warned politicians that paying the fee, otherwise known as the “permit to win” fee, would be considered as support to the rebel group. “Once na nagbigay kayo, malalaman din namin ‘yan. Merong repercussion yan. Pag nagbigay kayo, you will be supporting a terrorist organization, parang in effect ganun,” said Madriaga during the commemoration of the 9th Provincial Day of Peace at the Bohol Cultural Center in Tagbilaran City on Monday. The Army official urged candidates approached by the NPA to instead report the extortion attempt to the Philippine National Police or the AFP. “Sa mga mayors na pinapadalhan, we encourage you to report to us para magagawan natin ng paraan, para masugpo natin ‘yan. Makikiusap din kami na ‘wag kayo magbigay—pakiusap ‘yan ni President, ni DILG Secretary,” said Madriaga. So far, one incumbent mayor in the province has been asked by the rebel group to pay a PTC. However, the signatory of the letter sent to the mayor is an NPA commander based in Samar. “Hindi natin alam kung seryoso ‘yun o hindi, maaring bogus, but we are taking all of these things seriously,” he said. “Fortunately dito sa Bohol, konti na talaga armed group dito, very insignificant for them to do significant activities,” he added.